“ME” Time – Every Mom Deserves It ! This year, my life has been wrapped around my pregnancy in the first half and with the newborn for the latter half. 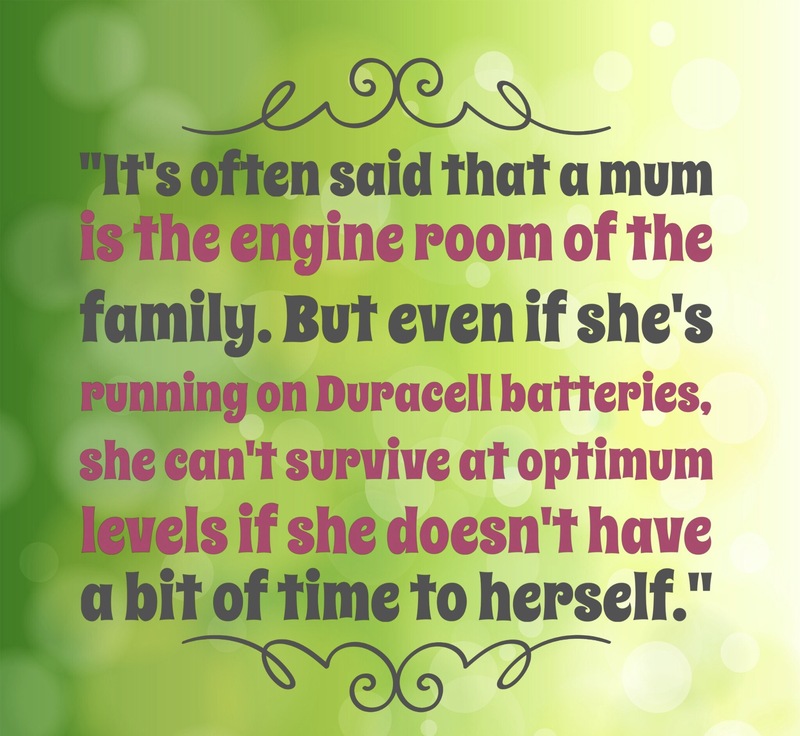 As a new mom, I don’t have time or energy to think about anything that does not directly impact my child’s life. I am constantly ensuring that everything runs smoothly and I am able to maintain a proper work -life balance. If you are a busy mom like me, you know how difficult it can be to find time for yourself. We are constantly ensuring that everyone is taken care of and are left with very little time for ourselves. Feeling burned out, exhausted, and also craving things that YOU love to do most. 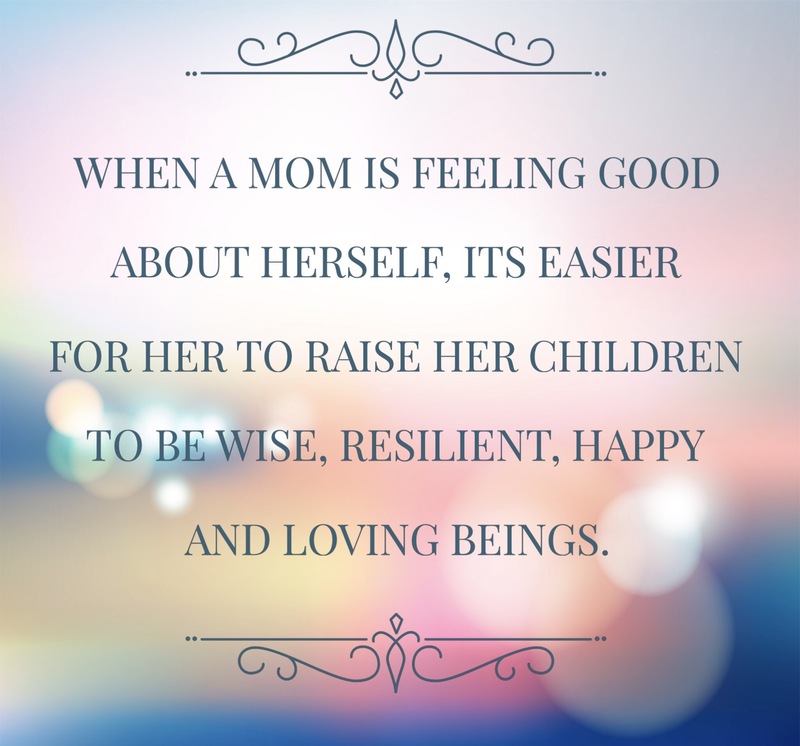 I honestly feel we MOMs need to pencil in some “ME” Time for ourselves. And I stress that one should not feel guilty for taking time for yourself. It’s important to schedule time for yourself on a regular basis so that you can feel refreshed and energized to be on top of our game. Stay Active: These days for me it is impossible to finish work and go out for a workout. Timing everything between mine and baby’s schedule well enough to get some sun is not simple anymore. So I recommend staying active at work or home by taking regular walks throughout the day especially if there is too much stress. If I can’t walk enough in the day or have no energy to workout, I make sure to get out for at least a 30 min stroll around the neighborhood with Vir in the stroller while listening to some peppy music. It helps clear the mind. Take a Bubble Bath: This is truly a relaxing and rejuvenating experience if you can take out some time from mom duty. I recommend treating yourself with some aroma therapy oils, bath bombs and candles. I have been shopping for more of these lately than makeup or beauty products. Get your favorite drink and read up: The best time to lounge and snuggle in a comfy blanket is when your children are sleeping. I can have coffee anytime of the day and with the chill in the weather these days I am also sipping on some soup. If you know me well I don’t read too many books, but I do love flipping through articles on magazines and journals on my ipad or just happily pinning. Ever since I started the blog I am also writing down my thoughts and working on new posts for all my readers. Go out with your friends: A girl’s night out or grabbing a drink at a pub with your family friends can be a great way to start a weekend. You can get a sitter for sometime if you are going with your husband or put him on daddy duty for the evening- while you dress up snazzy, put some heels and mascara!! It is very important to socialize and feel good about these moments. Don’t forget a Spa/massage day : I got a monthly massage membership at a local spa and this has been by far my most rewarding expense. An hour of deep tissue massage can do wonders as it takes away your stress and gives relief to those aching back and neck muscles. Don’t forget to check in yourself this Holiday season !! Lets Treat Ourselves too. Please do share what are your favorite ways to pamper yourself , or how you like to spend your “Me” Time. In my previous emotional post I wrote about my anxiety and fears as a new mom, who was leaving behind her 5 month baby for a work trip for the very first time. It was an emotionally challenging experience and physical one too, as I am exclusively breastfeeding Vir. I couldn’t have left my house without a plan for my family and support of my husband. As new parents we want to make sure we are doing everything right and at the same time hoping that things go smoothly. Introduce care giver ahead of time: I am working from home and of course to be most productive I need to be able to focus without distractions. After my family left, we got a nanny to manage Vir during my work hours. This worked well for us, as by the time I left for work to another city, Vir and my nanny had gotten used to each other. It is hard to trust someone else with your baby other than family, but having a good caregiver can be very comforting. Enlist a Trusted Relative or Friend: Thankfully my husband could take an off on one of the days in my absence at home and manage Vir. However, I am thankful to have a close set of friends whom I can trust Vir with. It is ideal to have someone living close to your home, just in case. Maintain sufficient supply of milk in the freezer: Vir is being exclusively breast fed and my biggest worry was running out of the frozen milk. I was short of 7-8 bags as per my calculation and so I made a plan to start pumping after every feeding to increase supply in 1 breast. I pumped only one side, so that I don’t run out of milk on the other. This worked perfectly and I was able to store milk and also give Vir his full feed. Also, I was eating more food that helped in lactation and drinking lots of water. Leaving behind Mom’s scent: I wore my husband’s T-shirt to bed for 3 days before I left, so that my scent could be transferred to it. In my absence Deep wore the same T shirt to soothe Vir and put him to sleep every night.This strategy also worked for us very well while we were crib training Vir and making him sleep in his nursery. I would leave my t-shirt on the side of his crib, so that he felt that I was around. Note: this might work for younger babies only. Make a List of Things related to the baby: A list with all information that is essential for the baby like feeding and nap routines, allergies , medication, place for baby gear and supplies, important phone numbers ,etc etc. This can be very handy for the care giver or your husband. I had emailed it and also printed it and left it on the refrigerator. I hope these tips come in handy if and when you plan to travel without your baby. There are a lot of things about Motherhood I am still discovering and I hope to share my experiences with all my readers. Planning ahead of time is key to our sanity! My head was hurting, my heart was racing. I felt I couldn’t breathe and all of this was happening exactly at the same time while I was waving goodbye to Vir from the window of my cab. Leaving the baby for the first time is not easy and even though I spent a ridiculous amount of time snuggling him and kissing him beforehand, the moment of panic at the door was not going away. I still can’t tell whether at that moment I was feeling guilty of leaving him for 2 days or if I was terrified of the thought of how will he survive without me. It was one of the weirdest moments of my life and is very hard to describe in words. It felt like I was carrying an extra bag that day – A bag of Guilt. Inside this extra baggage was the guilt of leaving Vir at home while I traveled, guilt of not rocking him to sleep those 2 nights, guilt of leaving my husband on his own to manage an infant and taking leave from work. From the moment I sat in the cab till I reached the airport, I was stuck to my phone the entire 40 minute drive, watching Vir play with his Nanny while I kept taking heavy breaths with moist eyes. Honestly I am so blessed to be a full time work from home mom. I can see my child whenever I want, have the flexibility to manage my work and calls, apart from adding income to the household and doing what I love most. Having a house with an office space I am able to get so much done effectively on a daily basis. And with the help of my nanny I don’t have to worry about Vir either. It’s the best scenario I could have asked for. However being a Sr. Account Manager and handling a huge pool of clients across the country, travel in my job role is inevitable. Honestly, I have always looked forward to my work trips as I not only get to reconnect with my colleagues but also get a break from my routine. Likely, most of you are not gasping in horror at the thought of leaving a 5 month baby with his daddy, while mom goes on a business trip. Business travel is fact of life for few moms far sooner than 5 months and many 5 month old babies are not exclusively breast fed. But this is a very big deal for me, as I never left Vir for more than few hours a handful of times until this unexpected work related travel. The very thought of getting on an airplane without Vir had been giving me heart palpitations. I was having anxiety of what might happen when I would be away. Will he be all right , will Deep be able to manage the baby, what if Vir doesn’t take the bottle , what if I miss my return flight, what if things falls apart…..I was losing my sleep. The angst of leaving a kid behind is natural and biological; it is out of concern for our children or even out of the fear of leaving our comfort zone as a new mom. The fact that we control our household makes leaving the responsibility on someone else more difficult. But having a supportive and understanding husband and a loving and hands on dad can make a mom’s life more manageable. I am so blessed to have a husband like Deep. He is a great dad and I knew in case of any urgency I can count on him to manage Vir. This trip was a huge learning experience for me and Deep on dealing with our fears and anxiety as first time parents. While Deep is now more confident in handling Vir, I am more comfortable in leaving the responsibility on daddy at unplanned situations. But then there are other situations out of our control, like my nanny was not able to make it the next day while I was out and the ordeal on the date I was flying back…. After a very productive meeting, I was looking forward to getting home from LA and snuggle with my baby. To avoid the crazy LA traffic I reached the airport early only to learn that my flight was delayed by an hour. I immediately rushed to the airlines counter to see if I could reschedule my flight to an earlier time, and I was lucky to get one. But, that luck was short-lived; I was put in another frustrating situation where my rescheduled flight was delayed by 4 hours due to maintenance!! Wow !! That is exactly what I needed on my first trip away from Vir. (Screaming in my brain) It almost felt like my nightmare was coming true. But honestly, there was no point getting mad at that time… Rather, I actually felt blessed, as the flight I was supposed to initially take got cancelled! After an exhausting 10 hour wait time from LA to Houston between flight delays, traffic and flying time, I was finally home at 11 pm holding Vir tightly in my arms, with a heart full of joy and a needy dog liking my face and asking for equal attention. Even though we might be connected with rapid transit and wireless technology, the emotional distance while traveling is challenging. I wish I could handle everything at once, but motherhood has taught me the unfortunate rule of being a human: I can’t. We have to make hard choices and cope up with the real world. And as a working mom I have to act like one and deal with my lifestyle changes while coming up with strategies that work for my family. Yes ! The Struggle is Real !! …In my next post I will be sharing with you how I prepared to leave my baby overnight for work and what I discovered about being a mom when I was off the clock. 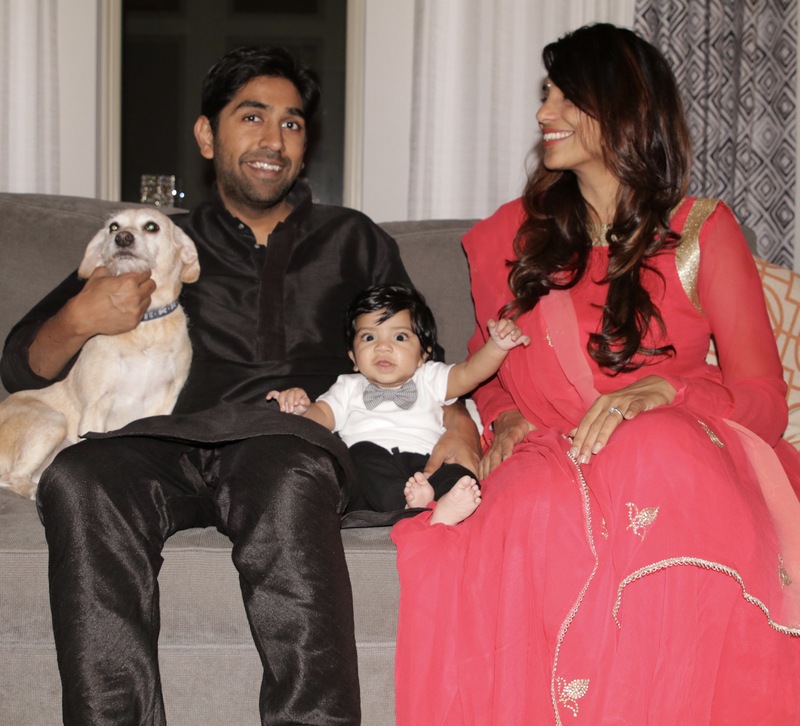 In my last post I wrote about how much I missed celebrating Diwali at home in India. And this year I long for it even more as its a very special one, since we have our beloved son Vir celebrating it with us . The entire week I was face timing with my mom and brother and hearing their daily activity updates, shopping sprees, reminiscing old days and getting to share the real Gharwali Diwali experience with them. My mom got Vir a really cute ethnic outfit which she will be sending with my cousin sister and even though its is arriving post Diwali, I am super excited to dress him up in it. There is a charm in wearing vibrant desi/ Indian clothes, they make the festival so much more authentic. Vir is 5 months old this month and loves being around people, he enjoys getting all the attention and lately has been putting his entire fist in the mouth and babbling. He has also started to flip over on his tummy and is in awe of Rio. Rio too has also started warming up to Vir and its a great feeling to see both my boys finally show some love towards each other. 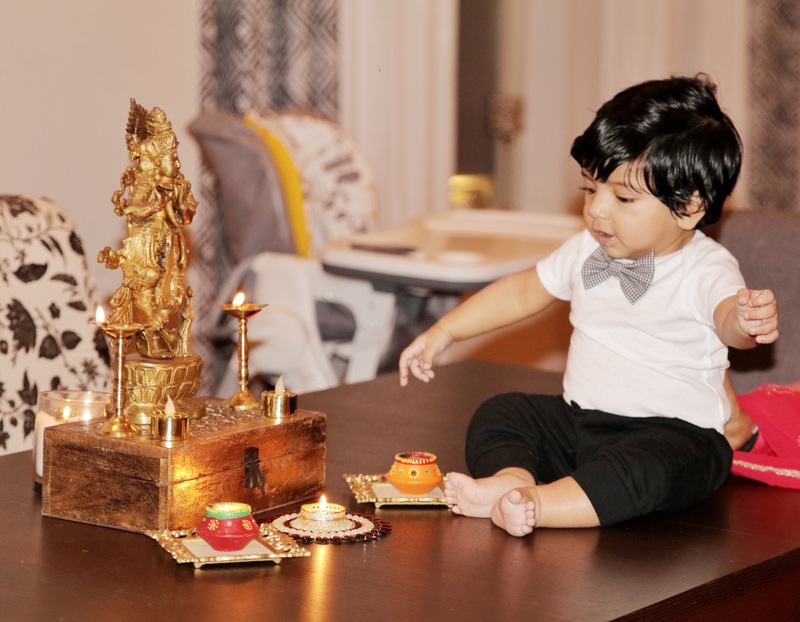 I am glad to share with you all, Vir’s first Diwali story at our home in Houston with these pictures.We celebrated it with our loving friends with great home cooked food, Coconut ladoos ,Rasgullas,music, lots of cheer , laughter and a long game of Flush. I hope you enjoy looking at them . Thanks to our friend Abhishek for these lovely clicks. Diwali cannot end without some sparkles. The focus of this pic was on our fur baby Rio who was waiting to eat mom’s coconut ladoos. When Our Fur Baby Met our Son! I am a mother of two. One is an adorable 3 month old who loves to smile and squeal.The other is a 5 year old terrier, who loves to chase squirrels and cuddle. One is our baby Vir and the other is our “fur baby” Rio ! Hell yes my dog is my baby!! I feed him, bathe him, walk him, play with him, take him to his vet appointments, buy him treats and toys, dress him up for Halloween, protect him from danger (stray cats in our neighborhood are vicious! ), worry about him all night if he is ill, comfort him when he is scared, take family pictures with him, miss him when I am traveling, scold him when he is naughty and most importantly, love him with all my heart as I am his MOM. No wonder I didn’t refrain from celebrating Motherhood as a Dog Mom for the past 5 years. Oprah’s quote – “Biology is the least of what makes… someone a mother” has stuck with me all this time. The feeling of maternal love and the sensibilities of a mother first came to me when we adopted Rio from a local shelter here in Houston, when he was just 4 weeks, back in 2011. He just didn’t walk into our house with his tiny paws; he walked straight into our hearts. We knew we were ready for this commitment of loving and caring for him for the rest of his life. His dark brown eyes and constant need for cuddle and kisses filled my heart with immeasurable love and an immediate need to protect and treasure him! For us Rio isn’t a domesticated animal but our first child. And I don’t mind saying that Rio trained me to be a better mom, since I made those classic first born child mistakes with him. I believe it is the little things that shape our relationships in life, and my relationship with Rio is no different. Everything I do for him results in love and gratitude. His unconditional love, boundless energy, unrestrained affection and loyalty make us smile even in the worst of days! The mere mention of “Let’s go” makes him jump with joy. Watching him stick his head out of the car window just cracks me up every time. And the best part of the day is coming home to a wagging tail. When we found out that we were pregnant we were excited that our pack was going to grow! From flooding hormones to slight differences in routine, it is more than likely that Rio picked up on changes even before I started sporting a bump. He would sit and stare at me and follow me everywhere in the house, especially when I was suffering from nausea. (He would always be standing outside the bathroom). Rio also started camping at my feet in the bed and liked laying his head next to my belly when we watched TV. Things would sometimes get weird when he would chew up my underwear while I was gone. Now that I think about it, maybe he was acting out or feeling neglected. But he was definitely picking up something. They say a dog can tell that you are pregnant “Although it hasn’t been scientifically explored, it’s within the realm of reason,” Jennie K. Willis, an applied animal behaviorist, told Animal Planet. Some people believe that it can be dangerous to bring a baby into a home with a dog. However, according to all the dog parents and owners between our family and friends; ‘Dogs have been loyal, loving and protective family members for them’. We were quite confident that Rio would be a good dog around Vir. As he prefers the company of human friends over dogs and is most excited when our friends come over (I think he is convinced that they are his buddies and are there to visit him). Yet, we often wondered how Rio would react when he would see Vir for the first time. Would he be scared, friendly, excited, indifferent or jealous? 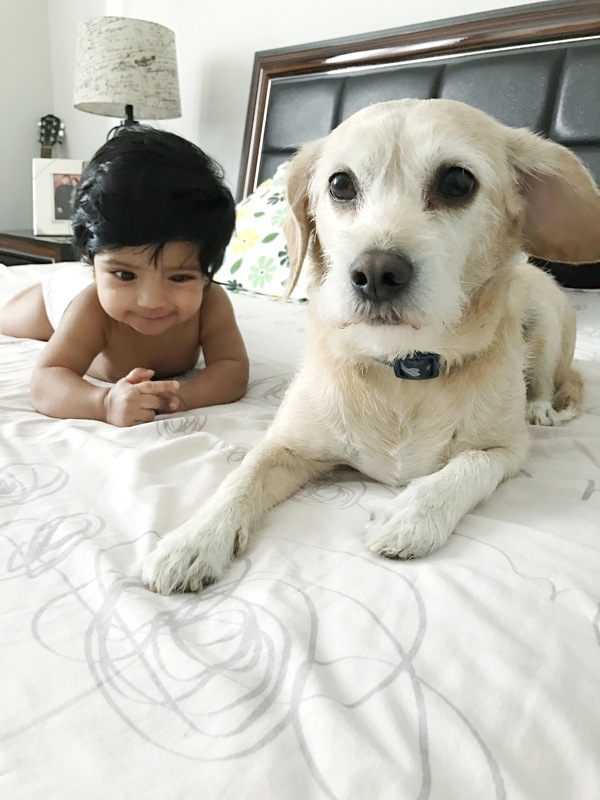 We researched online on how to introduce your baby for the first time to your dog, read online forums and checked out the cute videos recorded by awesome dog parents. Please look up dog adoption and training guide for more information and tips on dog and baby relationship. My relationship with Rio made me realize dogs are nothing like humans; they can go through hell, yet forgive easily. This kind of love is one of the best things in life to experience as he filled a space in my heart that I never knew existed. It is an amazing feeling to be licked on your face when you are stressed or rubbed by a wet nose when you are lonely. No matter how crappy your day is, there is always a happy face waiting for you to get home. I am thankful for my Dog for all the paw prints on my floor, for all the slobbery kisses on my face and for the fur on my clothes… for there will come a day when there is too much room in my bed. I am three months and 1 week postpartum and you might wonder why I am already talking about weight loss. I have been struggling to write this post and I wasn’t sure if I wanted to commit this to the blog. Yet, I am posting it and I have decided to do so because it will not only motivate me to continue to work towards my “goal” but also give me a chance to celebrate my progress so far. Will I ever get back to my pre-pregnancy physique? When will I hit my goal? How long will it take me to fit in my jeans? Will I have to continue buying bigger size clothes? Ahh!! .….all the questions pop up in my head as I step into my closet. No matter how many clothes are hanging in your closet, there are always those days when you feel you have nothing to wear. It’s all there but it’s all wrong and then you want to shop. I’ve faced this almost every day for last five months. Earlier I was so big that I could survive only in my maternity clothes and now, when I am neither 9 months pregnant nor my original size, I am in this no man’s land with only a handful of stuff I can fit in. To fulfill my goal and stick to this weight loss journey I am putting a stop to buying any bigger size dresses or jeans or shirts. I think that this will encourage me to stick to my workout routine and healthy lifestyle to get back in shape and not fall off the wagon. When one is a pregnant you get a license to pack on the pounds!! Now since I have been pregnant let me tell you this is a load of bull….. I was obsessed with my weight gain (some of you might relate to it, except for a lone few who can rise above the weight gain issue). I stepped on the scale every day, I wanted to make sure I stick to the healthy weight gain between 25-35 pounds; in fact my target was to gain under 30 pounds. I was eating healthy, eating more green vegetables, fruits, eggs, milk, multigrain bread; cheese etc. (Bought mostly organic food) Also made healthy smoothies with Greek yogurt, almond milk, chia seeds, hemp seeds, spinach etc as staple ingredients. I ensured that I was having high nutrition snacks like dry fruits and nutritive bars daily. As I wanted to be in the healthy weight gain spectrum, start first trimester I was running 3 miles, four times a week and swimming occasionally. Second trimester my energy started getting low and I began to walk 3 miles and do some weight training. Fast forward to third trimester I joined yoga and even with back pain issues I made it a point to go for a 2-3 mile walk daily with my fur baby Rio. Deep also accompanied me to keep me going. Yet I gained 43 pounds!! I couldn’t believe it. Moreover, my yoga class was torturous; To make matter worse, where I live, pregnancy seems so competitive ! Somehow everyone manages to stay slim and gain weight just around their belly. No matter how crazy the weight gain issue makes us, most doctors agree that we should keep check on our pregnancy weight gain, as many studies show it can lower risks of pre- eclampsia, gestational diabetes and other pregnancy complications. After baby Vir’s arrival in May 2016, I was looking forward to lose the weight so that I could feel like myself again. I wanted to live the lifestyle of my goal as I couldn’t believe that I had gained 43 pounds after working out almost every day and not falling for those ghee loaded “laddos” and sweets lying in my refrigerator. Within 3 weeks post delivery I had lost 15 pounds. Of course, Vir was 7 pounds of those. I read success stories online of women bouncing back to their pre-pregnancy weight in 4 months just by ‘breast feeding’. Also some stories mentioning that the ‘last 10 pounds will be the hardest to lose’ and how the ‘wider hips and bigger breasts are here to stay’. These anecdotes helped me prepare mentally as to what I should work towards to achieve my goals and at the same time be realistic about them! I believe its important to have your energy levels back; as life of a new mom is very demanding. I didn’t want to lie down and rest while my family manages things at home. The C section made mobility hard for me but I wanted to be up and working. For me getting my body back was also finding and developing my inner strength. Post my 6 week check up and getting thumbs up on starting my workout regimen from my doctor, I ensured that I got at least 4 days of workout weekly and started with 2 mile brisk walks around my neighborhood. The first few days of walking 2 miles were hard. My belly would hurt if I tried to jog, but gradually it started getting better. To kick start my workouts Deep bought me a Polar A 360 fitness tracker which helps me keep a tab on my daily steps, workouts and weekly fitness reports. It also buzzes every 50 mins prompting me to walk if I have been sitting for that long. I highly recommend getting a fitness tracker. Walking Rio while wearing Vir in Baby K’tan , 8 weeks postpartum. 2 months postpartum, I had lost a total of 22 pounds. Even after that I was somewhat horrified to discover that I still had a belly and looked 5 months pregnant. I still have 13 pounds more to go ! To reach my goal my fitness plan includes 3 miles for at least 4 days a week in the evening as its super hot here in Houston. Rio and Deep are my workout buddies and sometimes when the weather is good, Vir also join us in his jogger. (Highly recommend a getting a jogger so you can start going on long walk/runs with your baby. Great way to unwind and the babies seem to love it). Honestly, the new game Pokemon Go is also making my workouts more fun and has somewhat helped me maintain my 3 mile run and not cheat on my workouts. (I am very competitive when it comes to gaming and Deep is currently leading). I also do 1 minute planks 5 times everyday to strengthen my core muscles and tighten the belly. Since I am a breast feeding mama, I am not working on curbing my diet or following a restricted meal plan. I eat 6 small meals a day. Milk and fruits is a must daily and as I am a vegetarian, cottage cheese, pulses, beans and green veggies is what I live on. Yes I am chocoholic and I can’t do without 1-2 small pieces of dark chocolate daily and my homemade healthy popsicles . However now I have moved on to chocolate chips which are used in baking to work on my cravings and eat less calories. I also indulge in cupcakes and frozen yogurt on weekends. No soda, no junk and no processed food for me! !